PowerShell commands, usually in Verb-Noun format are Cmdlets ( “command lets”) used to automate tasks in Windows. In this tutorial I will share commands required to perform common tasks in Windows. Most Windows administrator will find this tutorial both useful and handy. Let’s do it! 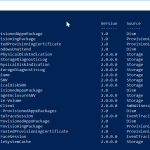 In this tutorial, I will use PowerShell Commands, PS, PowerShell Cmdlets and Cmdlets interchangeably. You cannot talk about PowerShell cmdlets without learning how to find them. 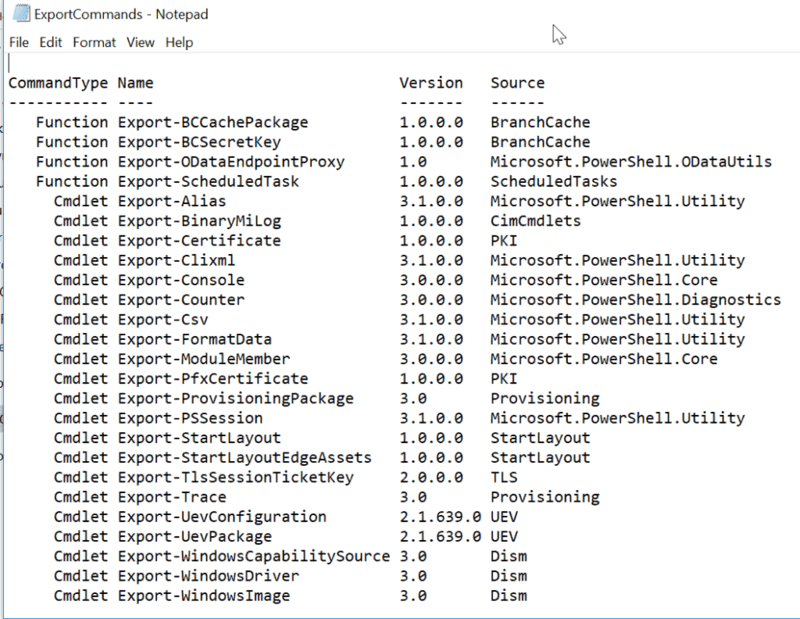 Below are the PowerShell commands that will help you find Cmdlets. The Get-Command Cmdlet is the first and most important PS a PowerShell newbie should learn and know how to use. Why? It helps you find other PowerShell Cmdlets. What command can be more important than a command that can do this? CommandType: This tells you whether command is an Alias, a Cmdlet, or a Function. Name: The name is the actual command you execute. Source: The module of the PS command. “EventLog” is the “Noun” part of the Cmdlets. However, if you don’t even know you could try adding the asterisks at the beginning then try the end. Below is the result of the pervious command. Lastly, before we move on, lets discuss the parameters of the Get-Command Cmdlet. This will give you all the information regarding the Get-Command Cmdlet. 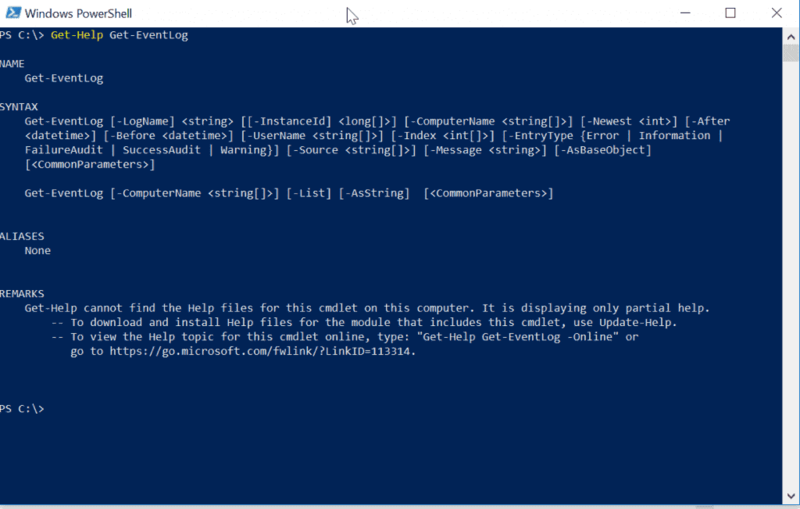 While the Get-Command Cmdlet finds the Cmdlet you need the Get-Help PowerShell command gives you the information you need to run the command. Like any other PowerShell Cmdlet, the Get-Help Cmdlet has a number of parameters. Below are the most important parameters you will need. -Detailed: The Detailed parameter gives you the command SYNTAX, PARAMTERS, ALIASES, and REMARKS. -Examples: Gives examples of how to use the Cmdlet. This can be very useful if you have never used the Cmdlet before and at a loss how to proceed. -Online: Opens the online help page of the Cmdlet. To see the parameters of a PS Cmdlet, type the Cmdlet in PS, hit the space key, type hyphen “-” followed by the tab key. As you press the tab key you will scroll through available parameters. Now that you know how to find PowerShell commands, lets get you in the hood. 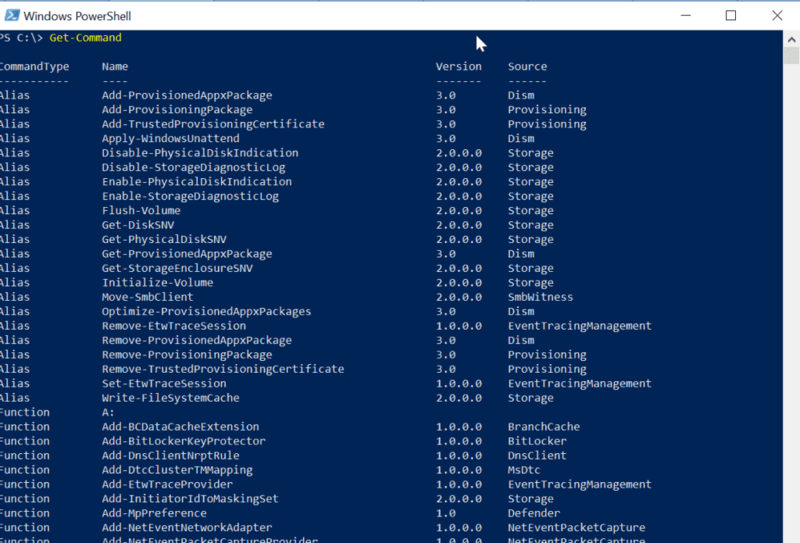 The next important set of PowerShell commands are Cmdlets to help you manage files and folders. This will list all the top level folders. To list all files, folders include sub-folders use the –Recurse parameter. You can combine the Get-ChildItem Cmdlet let with other Cmdlet to calculate the size of each folder in a specified directory. While the Copy-Item Cmdlet copies items from one location to another the Move-Item Cmdlet moves the item. This Cmdlet deletes specified items. Like the Copy-Item and Move-Item Cmdlets you could pipe the output of Get-ChildItem to Remove-Item. Use the Remove-Item Cmdlet with caution as it can delete all files and folders in your computer including Windows files! By piping the output of Get-ChildItem to Remove-Item, you could create a simple script that will delete some log files on regular bases. You could schedule the PS script to run at specified time using Windows Scheduler. 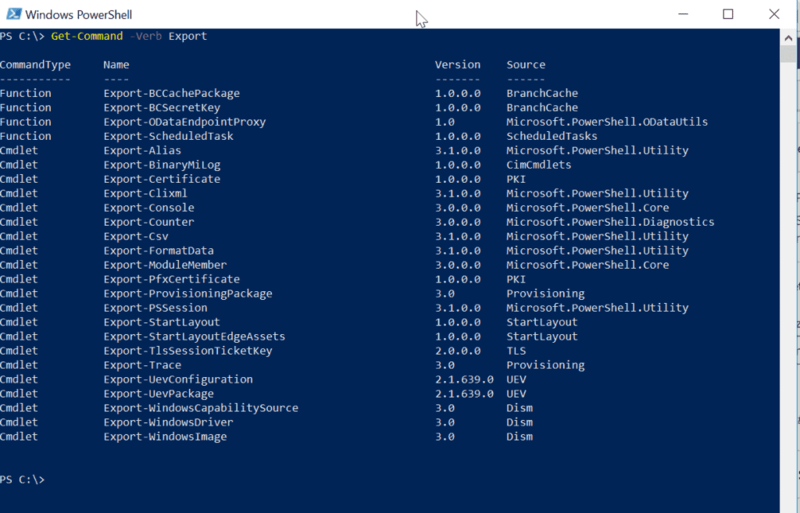 There are 3 sets of PowerShell commands that you can use to export items to CVS, export to text file and to HTML files. We will discuss these 3 next. Export-Csv converts a set of string into CSV and saves in a file. This Cmdlet is very important in reporting. Here is the result of the previous command. You can pipe the output of the previous command into Export-CSV to create a CVS report of the results shown in the previous image. Here is the command to accomplish this task. Note that I had to include the CSV file name to the path. I also have another parameter -NoTypeInformation. To learn more about -NoTypeInformation, read this article PowerShell NoTypeInformation: Applications and Uses. There is another Cmdlet in the previous command, Select-Object. This Cmdlet was used to specify the columns to return and export to CSV. If I excluded Select-Object the output of the CSV will contain a lot of unwanted data. Later in this tutorial, I will cover Select-Object. For your reference, below is the output of the CSV file. While this report is very similar to the output shown in the previous image, it is more useful as a report. You could send the CSV file to your boss! Here is the result in a text file: The same report, now in a text file! How good is that! What if you run this report daily and do not want to over-right the content from the previous day but rather append. This command will do the job. Another set of PowerShell commands important to Windows administrators are a set of Cmdlets to manage Windows processes. Let look at them. 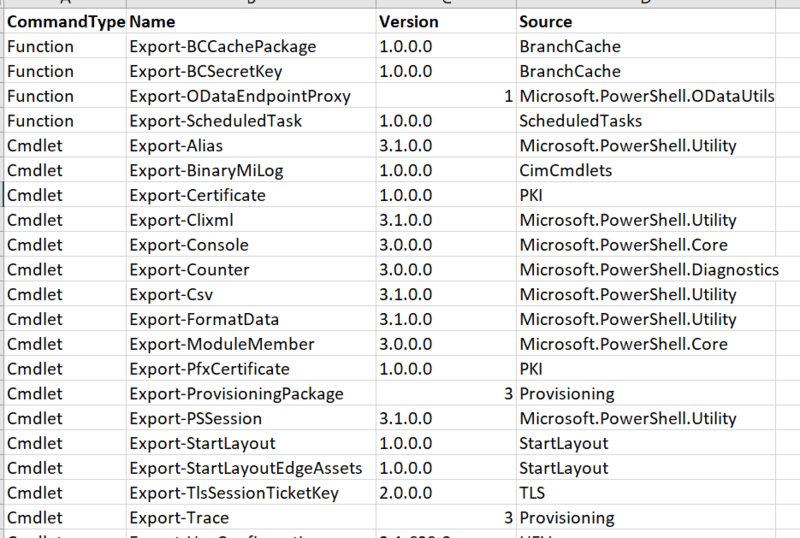 This PowerShell Cmdlet list all the processes running on a local computer . It could also get the processes running on a remote computer – with the –ComputerName parameter. However, when you run the Get-Process PowerShell Cmdlet without any parameter, it returns all processes running on the local computer. To try this, execute the command below. The result is shown in the image below. The Get-Process PowerShell Command can work with the Start-Process and Stop-Process PowerShell Cmdlets to start or stop a process or set of processes. Let’s say you executed the Get-Process PowerShell command but you wish to stop a process with a specific process ID 10500, the command below will do the job. Use the Stop-Process PowerShell Cmdlet with caution as stopping the wrong process could make your computer unstable. To start the process, pipe the output of the Get-Process PowerShell command to the Stop-Process PowerShell Cmdlet. Event log management is one of the most important tasks for Windows Administrators. 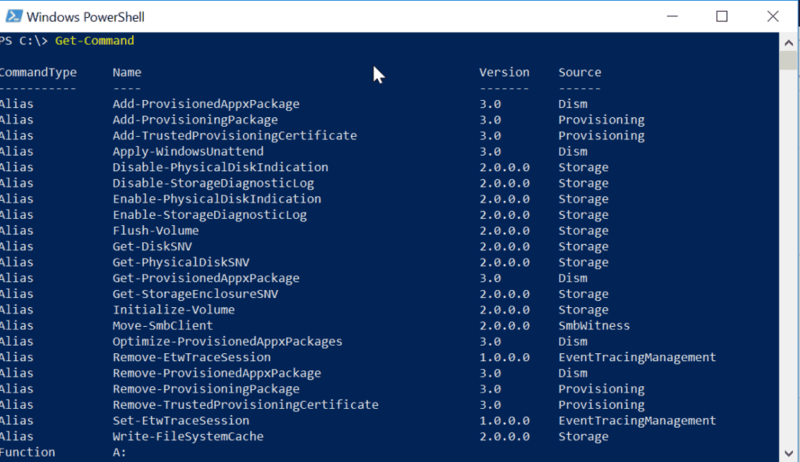 So, the next set of PowerShell commands will help you manage event logs. The Get-EventLog PowerShell Cmdlet gets events in a specified event log. You can get events in a local or remote computer. To get events from a remote computer, use the –ComputerName parameter to specify the remote computer. However, note that you will require the right permissions to access the remote computer. The last command could be used for troubleshooting purposes. As you would expect there are more event log Cmdlets but we will cover this 2 for this tutorial. The Clear-EventLog clears all events in the specified event log. The Cmdlet can clear event logs on both local and remote computers. To execute the command below, you need to open PowherShell as Administrator – right-click and select Run as Administrator. 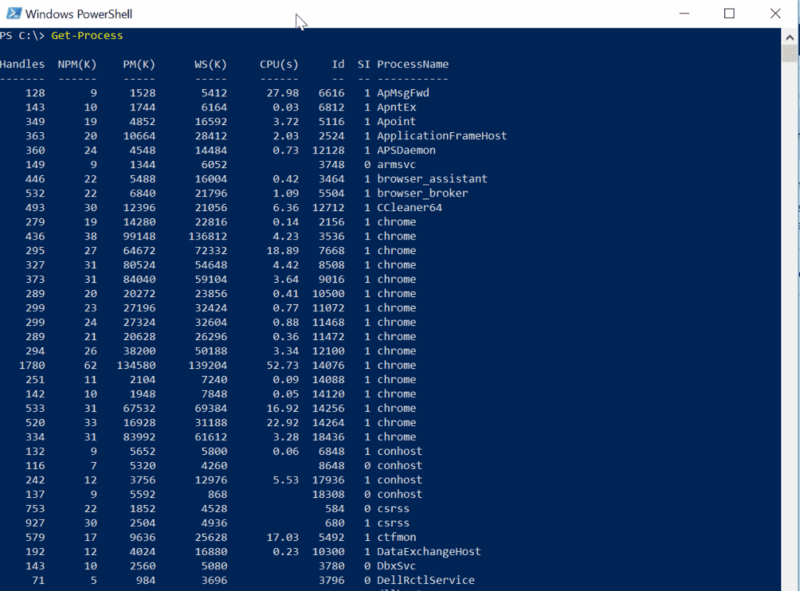 If you need to collect data about computers on your network – Computer Name, BIOS Version, RAM size, Disk Information, etc – Get-WmiObject POwerShell Cmdlet is your friend! lets explore this powerful Cmdlet, shall we. You cannot discuss PowerShell commands without talking about PS remoting. As a Windows Systems Administrator you will need to remotely connect to computers using PowerShell. Here are the commands you will need . The Enter-PSSession PowerShell command allows you to interactively start a remote PS session on a single computer. When you finish with the remote computer, end the session with the Exit-PSSession command. While the Enter-PSSession PowerShell Cmdlet allows you to execute commands on a single remote computer, the Invoke-Command Cmdlet allows you to execute commands on one or more remote computers. The New-PSSession PowerShell Cmdlet allows you to open a persistent session with a remote computer. Because the session is persistent, it is a good idea to add the remote session in a variable. I stored the results of the Get-Process command in a variable called $Processes because there are multiple computers. Storing the result in a variable makes for easy data manipulation. You could use a ForEach loop to extract and organise the data. This entry was posted in PowerShell Commands, Powershell Scripts. Bookmark the permalink.